Washington DC had a very unusual earthquake in 2011. It destroyed some of the statuary at the National Cathedral and cracked the Washington Monument, an iconic obelisk-shaped landmark in the center of the city. This summer a massive scaffold has gone up over the tower to continue the repairs. Reconstruction and restoration are common sights for travelers where long-term improvement projects often leave facades covered and historic interiors obstructed. You can still enjoy these sites with in most cases with minimal impact on your visit! Restoration of the Washington Monument takes place behind an artistic scaffold. In general, a reconstruction team is very much aware that they are essentially hiding a notable site and will take steps to accommodate the public whenever possible. Work may be segmented so limited portions of a cathedral are covered at any one time. 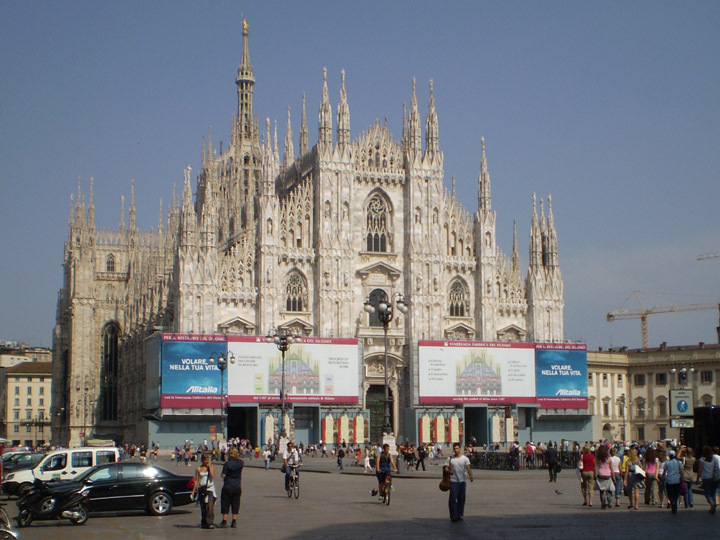 I visited the Duomo of Milan in the early stages of its recent exterior restoration. Only the lowest level was covered and there were great informational signs explaining each discreet step of the repair. I very much like the exterior of the Washington Monument scaffolds. Blue netting has been hung to create the illusion of blocks thereby creating a more interesting appearance than a construction zone. It is a nice touch considering the entire structure has to be encased. Sadly, the night-time scaffold lighting isn’t consistent with this block pattern. 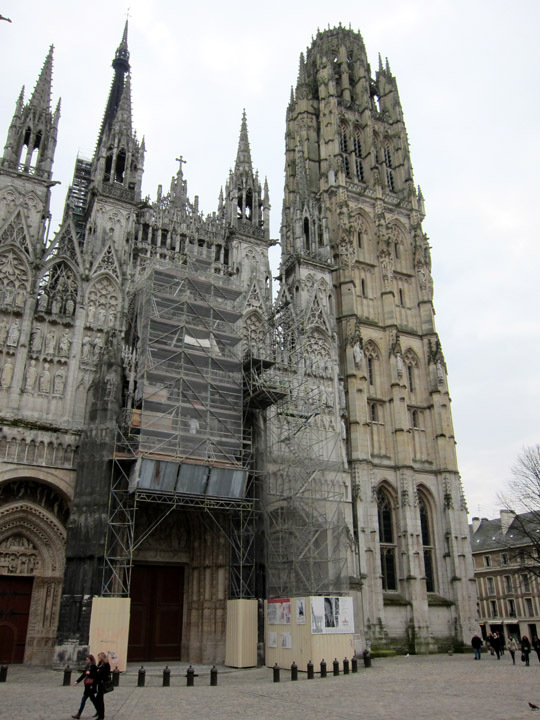 The interior of the Church of Saint-Maclou in Rouen was closed to visitors and the exterior was almost completely covered in scaffolding. 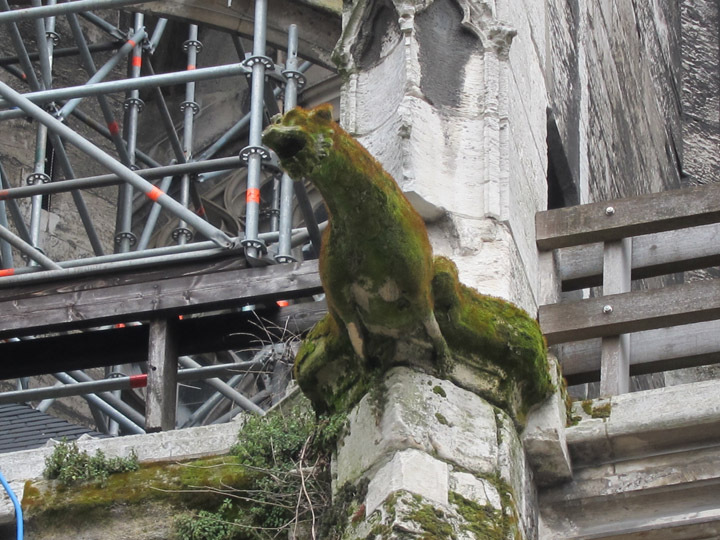 Judging from this mossy gargoyle, the work is definitely needed. To avoid disappointment, it is a great idea to check ahead for any on-going construction before planning your itinerary. If a building is completely closed, it’s better to know early so you don’t spend time getting to a site only to be disappointed. 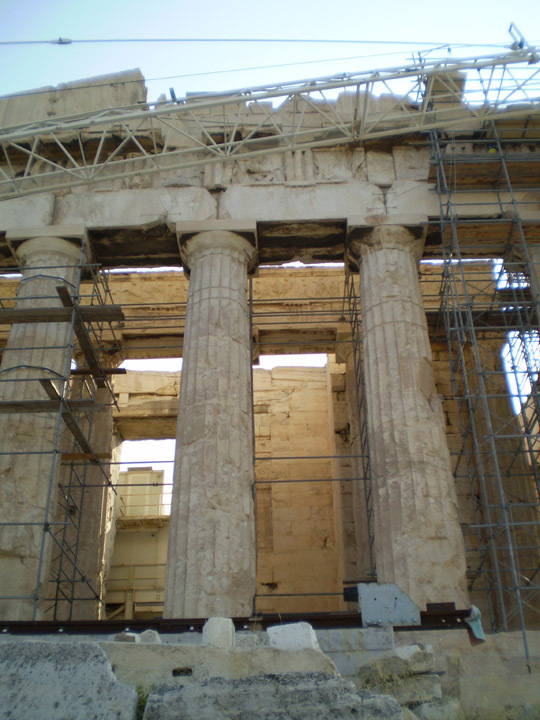 After Christian remodeling, crude theft and an explosion, the Parthenon is going to be undergoing reconstruction for decades. Many of these projects are years in duration and so you will almost certainly run into on-going work. Just remember that restoration is an important part of preserving historic landmarks and so you should take the occasional scaffolding in stride. Rouen Cathedral in France has an intricate and beautiful sculptural facade that must be restored slowly and luckily in small pieces. You will still find something to enjoy even if the view is a little obstructed. Visitors to the Hagia Sophia in 2010 were probably in awe of that magnificent interior space even though ceiling repairs were underway. There’s always the option to revisit a site after construction is completed. Imagine having seen the dark muted ceiling of the Sistine Chapel or perhaps its partial restoration and then visiting the incredibly colorful masterpiece today? 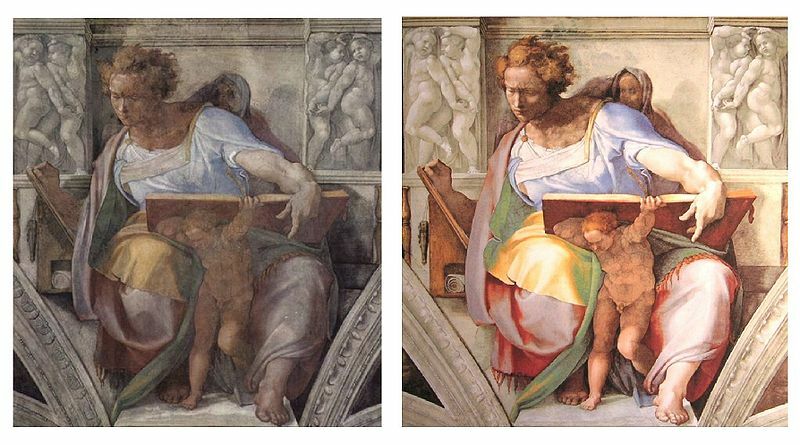 It would be worth another trip to Rome just to see the restorations completed. It also helps us justify the years of scaffolding at the Vatican; to see the outcome, you know it was worth it. As much as I would have liked to see some places in my travels, construction closures have bumped some to my next trip. Not far from Olympia is the Temple of Apollo Epicurius in Bassae, a 450 BC limestone UNESCO World Heritage. Badly damaged by acid rain, the temple was placed under a tent in 1987 and has had limited visitor access. Since I was never able to get opening hour confirmation and since the temple was several hours away, I decided to skip it this time. I also really wanted to see the brilliant Byzantine mosaics of the Daphni Monastery (of Dafni Monastery) outside Athens. Unfortunately earthquake damage has closed the site since 1999 so that was also a no-go. In the last year, visitors have been let inside to view the on-going restoration but on a limited basis, i.e. one morning a week… maybe. Sounds like something you will definitely need to call ahead and arrange. I know that the outcome of these restorations is well worth the wait! So have you ever been disappointed to see a highly anticipated treasure obstructed or closed for repair? Or have you not minded it and still enjoyed your visit? 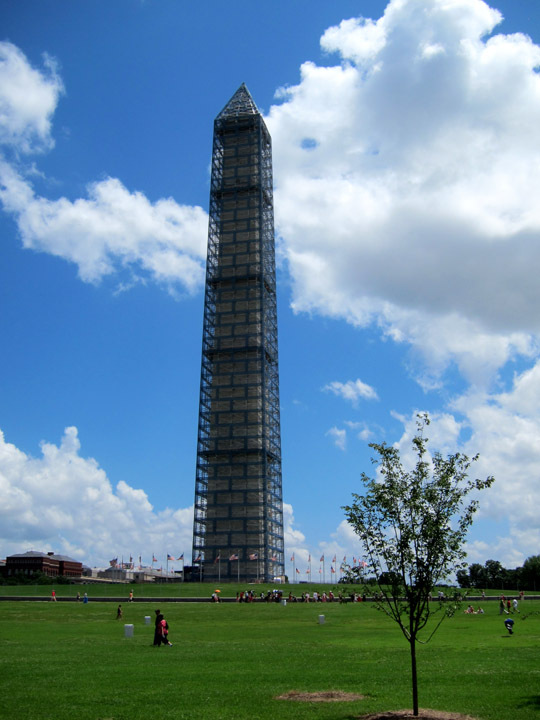 The scaffolding on the Washington Monument really is quite attractive! I missed seeing the Scrovegni chapel in Padua once because it was being restored, but I had called ahead to reserve a ticket, so I didn’t suffer the disappointment of going all the way to the museum to find out the chapel was closed. When I did get to see it a couple of years later, it looked wonderful, and I think I was even more excited to see it after the long wait. I was disappointed when I found out that Neuschwanstein had scaffolding, but read that most of it was on one side and that I’d still be able to get a good view of the castle. Turns out, I didn’t even notice the scaffolding because of the thick fog that obscured the castle anyway. When I visited Venice several years ago, I remember liking the false facades they created for buildings being restored. Even though it was obvious that the facade was a very large screen, it still made it nice to see what the building would have looked like.